Feliz Dia De Los Madres! We have had a delightful day here in Nogales. We began the day with some self care led by Sandra, where we gathered to focus on how we take care of ourselves physically, mentally, emotionally and spiritually in the intense days ahead. Then it was off to church at Sol de Justicia. The service was beautiful and we enjoyed trying to sing along to the Spanish songs. For Mother’s Day the service had involvement from the children and was even led by Jeannette’s daughter Rebecca. Though most of us couldn’t understand all or any of what was being said, the emotion behind the poems, the tributes to mothers and the preaching touched us all. Shout out to all of our mothers: we miss you tons and we celebrate you today, even though we are far apart. We joined the church for lunch and had yet another amazing meal, learning the word ‘rico’ – delicious! 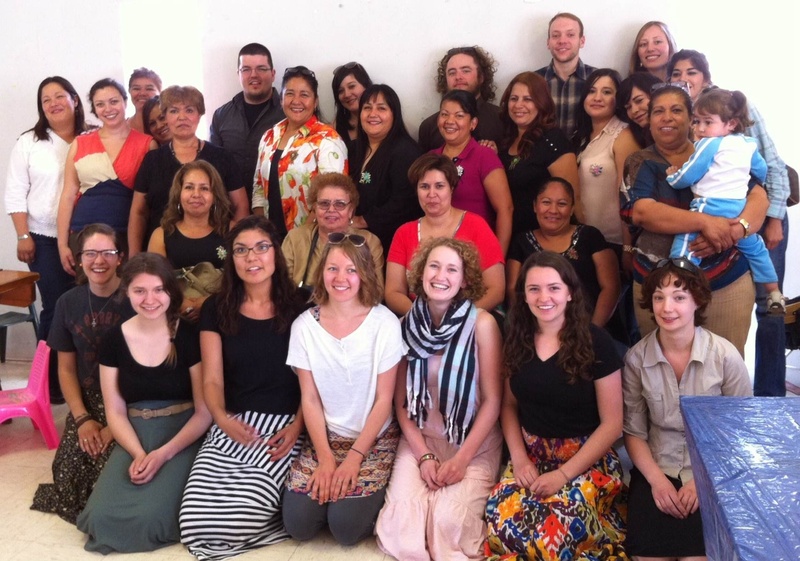 Our group with all the madres at church. After a stop for coffee and snacks on the way back (you’ve already heard how we feel about coffee) the group took an hour to rest before being given a presentation on HEPAC, the organization we are staying with. We learned about Nogales and the ways it has been affected by NAFTA and other social and economic forces. Though the situation is complex and often disheartening, the group was filled with hope as Jeannette shared stories of how HEPAC has formed in response and created beauty and life from the hardship. Adult education programs, a food program for school kids and a community garden are some of the ways that HEPAC has been fighting for peace and justice here in Nogales. I personally feel incredibly inspired by all who are involved because of their resiliency, perseverance and hope. God’s blessing and grace is apparent through these workers – they are truly his hands and feet here on earth. This evening we had supper at Elena’s house – (she is a volunteer at HEPAC) along with her daughters Jaclyn and Jasmine. Along with some more great food and attempted bilingual conversation, we were reminded that laughter (as well as fart noises – thanks Thomas) are the same in every language. It’s time for some rest before a couple of full days. Thanks for your prayers and support! Best wishes, Megan, to you and to the entire group. You all are in our thoughts and prayers. Thank you Krystal for this update! Sending you guys much love and thought as you take in all these stories. Keep blogging if you can – we love learning through your reflections!